Motorsport as passion. Driving pleasure as mission. Perfection as driving force. Always with one target in mind: To create automobiles with the potential to become legends. BMW M’s roots lie in the brand’s involvement in motorsports. Born on the racetrack and at home on every road, BMW M has been developing fascinating cars with thrilling performance and pioneering concepts for pure driving pleasure since 1972. The exclusively equipped cars meet even the highest demands for agility, dynamics and power with ease. Powerful engines combined with an expressive design and top-class functionality are evidence of how much passion is involved in the construction of each individual vehicle. The letter M has always stood for more than aesthetics and innovation power – it is a symbol of high-performance racing engines and unique holistic vehicle concepts. 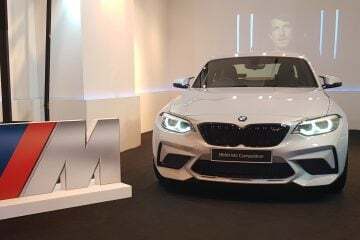 High performance, outstanding technology and the true sensation of motor sports can be expressed in one single letter: M.
PT Trans Eurokars is the only BMW dealer which has exclusive rights to represent and sell BMW M cars in Indonesia. M Town is not just a city. It’s an empire built for BMW M Fans. Only in M Town the air is filled with the sweet scent of burnt rubber. Smooth asphalt asks to dance with your tyres. And tunnels are the stage of beautiful symphonies. It’s the utopia for every real car enthusiast.